How can Latin America escape it's middle-income trap? 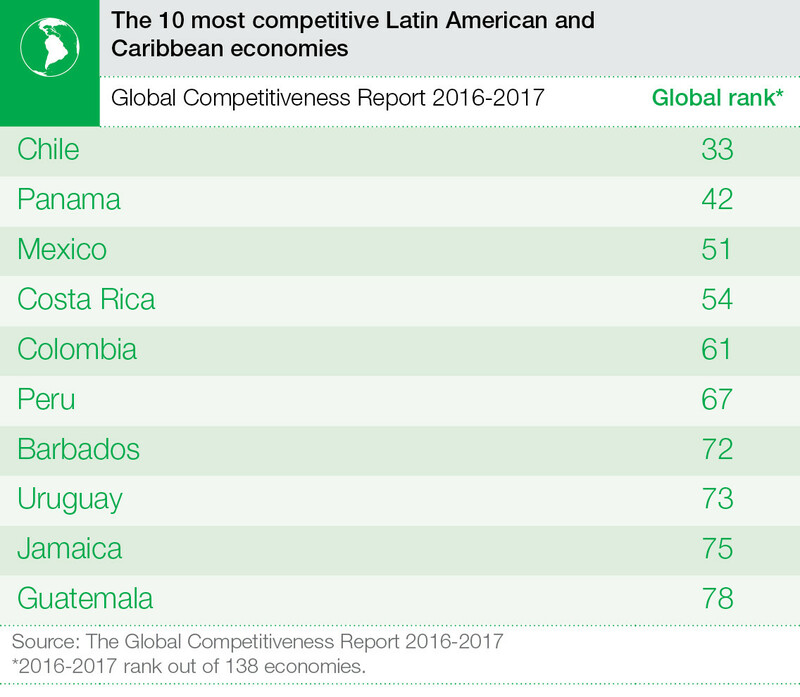 This year’s Global Competitiveness Report has good, bad and ugly news for Latin America and the Caribbean. The top performing country in the region remains Chile (33th), rising two places in the rankings, followed by Panama (42th), which moves up eight places. Costa Rica falls slightly to 54th, while Mexico (51st) moves up six. In fact, 4 of the top 10 highest movers this year come from the Latin America and Caribbean region: Jamaica, Panama, Dominican Republic, and Mexico. Among the economies falling in the ranking are El Salvador, Ecuador, Brazil, Trinidad and Tobago, and Bolivia. 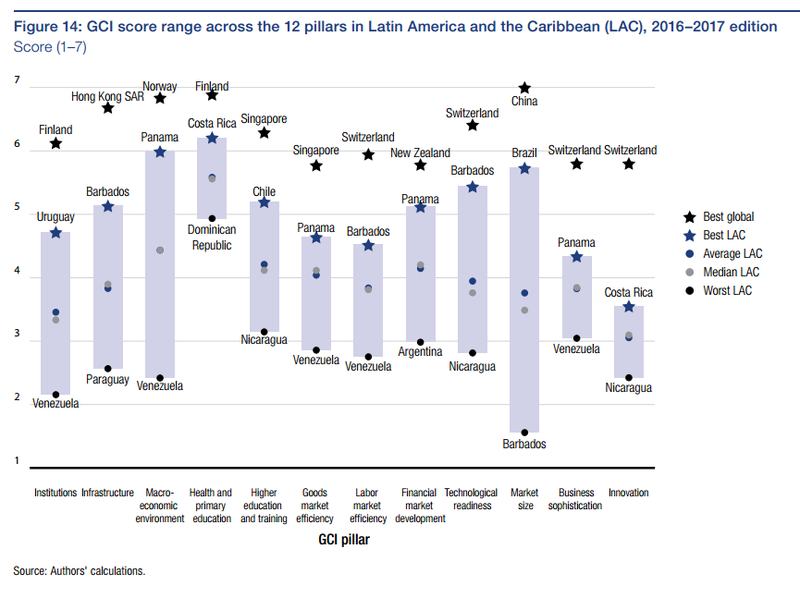 The overall range of scores in Latin America and the Caribbean remains significant, with the worst-ranked in 130th place and the best-ranked in 33rd. Within the pillars, the largest regional gaps remain in macroeconomic environment, reflecting the magnitude of the commodity and investment shock on commodity-exporting countries, and size of domestic markets. We also see an increased dispersion within the institutions pillar, driven by the ethics and corruption subpillars and recent scandals in the region. The chart below shows the best, worst, median, and mean performer in the region - and the best global performer - on each of the 12 pillars of the Global Competitiveness Index. This allows us to understand the sources of regional inequality driving differences in productivity and growth, as well as the gap between the regional and global top performers. Although Latin America and the Caribbean has made some progress, large gaps remain across all pillars. The largest gaps with the best global performer are in business sophistication and innovation, where Panama and Costa Rica lead the region. Other large gaps are seen in infrastructure, institutions, and labor market efficiency. After almost a decade of strong growth following the global financial crisis, growth rates in the region have fallen and several countries are now heading into recession. The end of the commodity super-cycle resulted in a drop in export values for major commodity-exporting countries, including Brazil, Venezuela, Colombia, Ecuador, and Argentina. The subsequent fall in global trade has also hit demand for manufacturing goods, further reducing the value of exports across most of the region. The result of this negative terms-of-trade shock has been a large trade deficit, producing current account deficits and government budget deficits. Despite the relative depreciation of the region’s floating currencies against the US dollar, exports have not recovered. This makes evident the magnitude of the competitiveness challenges in the region, where productivity has been falling, on average, during the last 20 years. The chart below compares the results of oil-exporting countries and non-oil-exporting countries in the region. 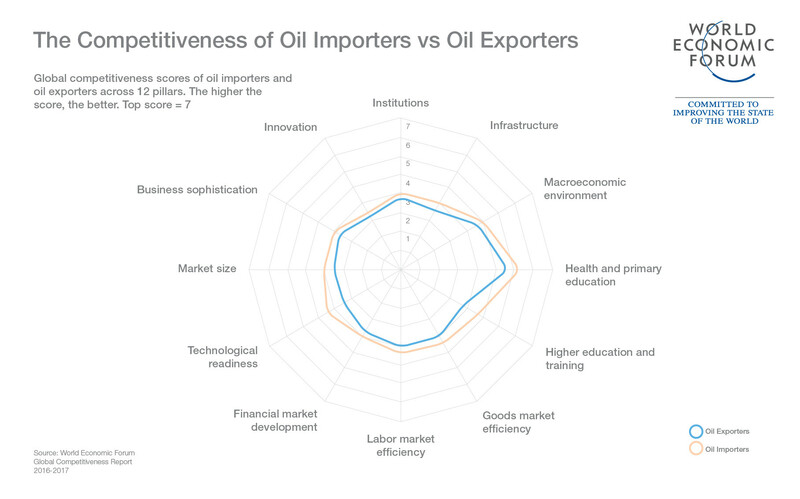 Oil-exporting countries see a large drop in macroeconomic performance, and they perform worse than non-oil exporting countries in institutions, infrastructure, goods market efficiency, labor market efficiency, and financial development. The commodity boom masked the need to make urgent progress on pending competitiveness gaps. Large inflows of FDI, oil prices above $100, and the resulting export and government revenue increases all reduced the urgency of advancing on a competitiveness agenda that would allow new growth sectors to emerge. Oil-exporting countries in the region are now facing the consequences of unfinished work on all fronts. They also have the opportunity to respond with renewed competitiveness agendas. The Global Competitiveness Report urges countries to reignite growth through comprehensive, public-private agendas that address all pillars of competitiveness. We hope the report will catalyze efforts and serve as a tool for policy makers, the business community and civil society to identify priorities, monitor progress, identify best practices and construct shared visions of future prosperity.